With the advent of apps, free music was sure to be available, and there are of course a variety of places you can enjoy free new age music anytime you want. Finding exactly which app is best for you is easy too when you visit the iTunes store, where you can download free, legal music right to your iPhone or iPod. iTunes has a Free New Age Piano App for iPhone, iPad, and iPod Touch. On the New Age Piano app, you can listen to 60 free songs by 20 of the top new age pianists in the music business. With the iTunes app, you can also visit the artist’s websites, watch videos, connect on Facebook, and purchase songs and albums by your favorite artist. Some of the artists with free music on the iTunes new age piano app are artists I know, or are artists I wrote reviews for over the years. Laura Sullivan is one artist featured on the Free New Age Piano App by her 3 songs, as is Chad Lawson, Doug Hammer, James Cahall, Ken Elkinson, Mark Pinkus and Peter Kater. New age piano artists on the iTunes app also include Brian Turner, Clifford Borg, Gary Farr, Jason Farnham, Joseph Akins, Louis Landon, Philip Wesley, Rebecca Oswald, Richard P. John, Robin Spielberg, Steven Cravis and Wayne Gratz. 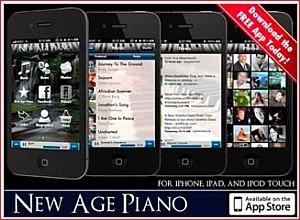 Find the New Age Piano App at the iTunes App Store, and visit Laura-Sullivan.com. Photo is courtesy laura-sullivan.com. If you were a touring concert pianist with Julio Iglesias most artists who play the piano at this level would be perfectly content performing sold out concerts with a star performer, but Chad Lawson is not like most new age pianist in this respect. Performing concert tours with Julio Iglesias before thousands of people was of course rewarding as anyone could imagine, and it speaks of his talents as a pianist, but Chad Lawson’s solo piano career was waiting. During his career he was the leader of his own jazz trio, contributed to albums of a variety of great artists, and has produced several film scores, with another movie score nearing completion. 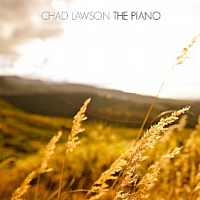 Chad Lawson’s new solo piano release entitled The Piano is another great album from this artist who won Whisperings Album of the Year award in 2009 with his debut solo album entitled Set On A Hill. His debut solo piano album produced by GRAMMY® Award winner Will Ackerman, moved Chad’s solo career in a positive new direction. Today his newest release highlights the compositions of Johann Sebastian Bach. The Piano featuring 10 songs of Chad Lawson’s latest songs for solo piano can be sampled by the song video of Nocturne in a Minor shown below. Visit ChadLawson.com to sample or purchase The Piano or go to his amazon.com page.